The Gowanus Lounge: Shroud Lifted from Williamsburgh Savings Bank Building! Shroud Lifted from Williamsburgh Savings Bank Building! 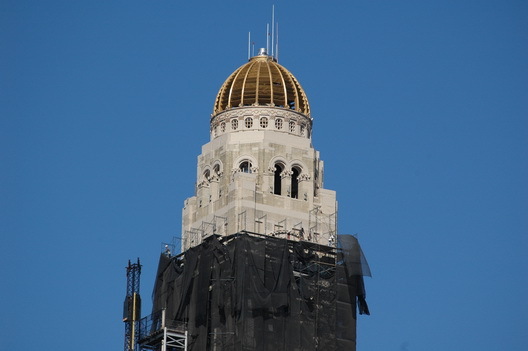 Workers were busy yesterday lifting the black shroud that has surrounded the Williamsburgh Savings Bank Building all year. The black netting was supposed to have been down by July 4, but there was a bit of a delay. Nonetheless, netting and scaffold removal was in full swing when we stopped by. This photo was shot around 3PM and there was significantly less netting than Friday evening around 7PM. So, who knows, there's probably even less right now on Sunday morning. huzzah! i've been itching to see this building complete for some time.